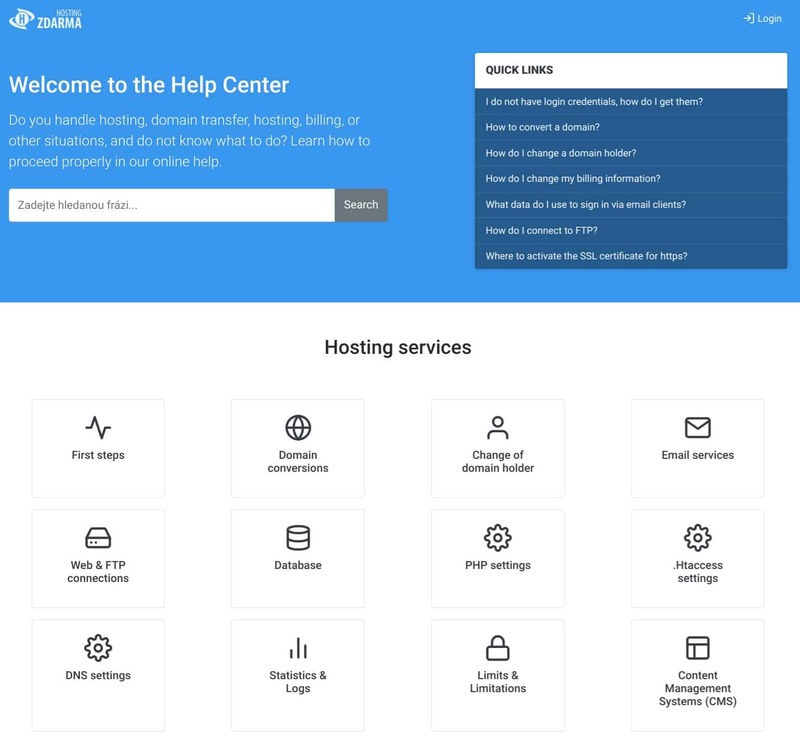 Hosting Zdarma Review 2019: Is Hosting Zdarma a Good Hosting? Hosting Zdarma offers super-cheap web hosting plans to suit all needs from individual users and small businesses to bigger companies and e-stores. 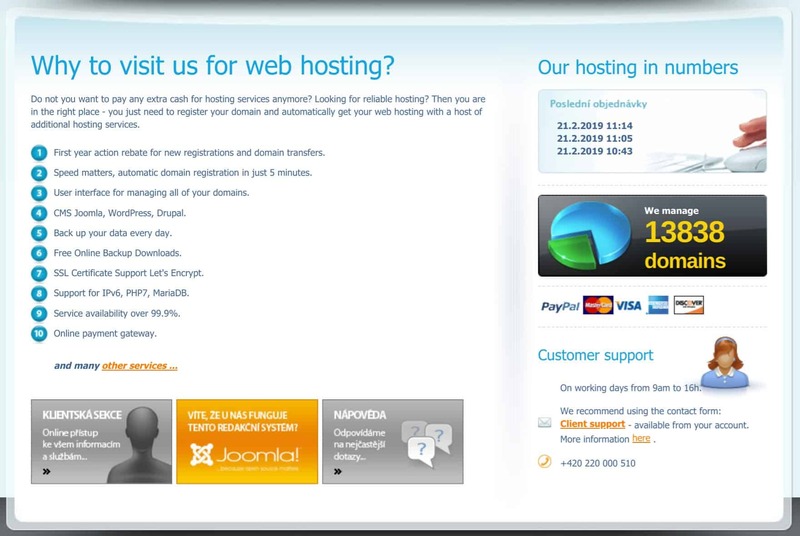 Czech company Hosting Zdarma offers a variety of hosting services including shared web hosting, domain services, email services, and content management systems. This provider manages almost 14,000 domains for mainly local Czech customers, and its website is in the Czech language. Hosting Zdarma offers three shared web hosting plans that differ in terms of disk space (200 MB to 10,000 MB), monthly data transfer (20 GB to 80 GB), and the number of CPU instructions / server threads. The entry-level ‘Start’ plan is ideal for individuals and businesses looking for a smaller online presence, but those dealing with higher traffic demands will need the Komplet Plus plan. You also get tools like Webmail, phpMyAdmin, and statistics/logs to help you manage your domain and gain useful insights about your visitors. Also, an auto-installer is provided for popular CMS systems (WordPress, Joomla, Drupal) and e-shops (PrestaShop, osCommerce, Zen Cart). Hosting Zdarma offers “Service availability over 99.9%” which is a little low by industry standards. Hosting Zdarma’s shared hosting plans are available at very low prices, and you get discounts for annual plans. But despite such low prices, this company doesn’t compromise on quality. You can pay for plans monthly or annually via bank transfer (Czech koruna only) or via an online payment gateway that accepts Visa and Mastercard. There is no free trial period, but customer services confirmed to me that you can request a refund within 14 days. For super-cheap Czech hosting backed by comprehensive customer documentation, Hosting Zdarma shouldn’t definitely be on your list of hosts to try. But with no free trial, you’ll have to take a leap of faith and rely on requesting a refund within 14 days if you’re not entirely happy. Wondering how Hosting Zdarma stacks up against other Web Hosting companies? Enter any other Web Hosting company and we will give you a side-by-side comparison.